This alluring Alyce Paris 6217 gown is stylish, elegant and sassy. The sweetheart bodice is embellished with dazzling jewels and has a flawless cut-out that shows just enough skin. 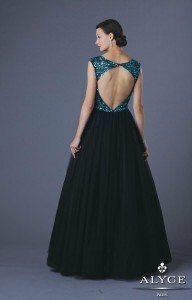 The tooled bottom of this dress is crown-worthy - perfect for any prom, pageant, gala or debutante ball.